Exterior window treatments in Italy are all about expression. Simple, fancy, flirty, elegant, baroque or rustic - the one thing all Italian outdoor window treatments have in common is brio! ♦ ... flowers & climbing plants. 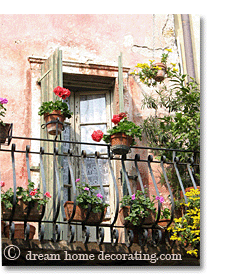 ... it's the exterior window treatments where the Italians' knack for abundant flower decoration really shines. Don't believe me? Do read on, there's proof! And if you want a really rich, warm & vibrant Mediterranean look for your outside window treatment, flowers are definitely the way to go. ... because in the summer heat you want to be able to close outside window covers without flowerpots getting in the way. There are several ways of creating a flower display around your window, and many Tuscan exterior window treatments combine all of them. A wall covered entirely in flowerpots like these is not unheard of in Tuscany! Generally, Italians prefer untreated, simple terracotta pots for their exterior window treatments - I've never seen rustic windows in Tuscany that were decorated with glazed, painted, or otherwise fanciful flowerpots. The simple window treatments blend well with Tuscan stone walls and show off the deep, glowing color of the flowers in all their glory. You need a length of sturdy gardening wire and a strong hook per flowerpot. Find something you can use as a spacer (e.g. some kindling or a pebble) and hold it to the side of the flowerpot, as illustrated. Wrap the wire (not too tightly) around the pot and the spacer a few times. Then pull out the spacer, and twist the excess wire into a loop. Make sure the wire is tight enough and cannot slip over the rim of the pot, and the eyelet is large enough to fit over the hook. Place the hook in the wall where you want the flowerpot to go ... job done! Install a trellis below and/or to the sides of the window. Wrap gardening wire around each flowerpot (as in Version 1), and hang loads of pots onto the trellis with butcher hooks. For added oomph, paint the trellis dark green, or any color that works well with your house and your flowers. This is not a strictly Italian style of exterior window treatments, but in the absence of colorful outdoor wood shutters, a painted trellis can add interesting texture and color to the façade of your home. This type of exterior window treatments is very common in Tuscany and Northern Italy. If you have a grilled window with decorative wrought-iron bars, attach a wrought-iron window box to the grille. Then pack the container tightly with pots of herbs and geranium. In Tuscany, sometimes these metal window boxes have additional rings attached to the rim for even more flowerpots, so they really are overflowing with rich, hot color. Wall mounted terracotta planters like these are easy to install. ... otherwise it's better to fill them with potted plants to ensure sufficient drainage. If it suits your tastes and your home, you could simply grow your exterior window treatments. In Tuscany, the plant of choice is often star jasmine (trachelospermum jasminoides), as shown in this picture. a climbing rose like Gloire de Dijon (a.k.a. "Old Glory"), or the beautifully scented Madame Alfred Carrière, or the extremely hardy Wild Edric. give a façade color, rhythm and texture. Italian outside window shutters often have several settings. Not only can you open and close the shutters themselves; you can also open and close the louvers, and the shutters can be angled out to allow airflow while still providing shade for the room. Like other wall decoration, outside window shutters have an important decorative function. By comparison, the outside window treatment pictured right looks very unassuming. However, these shutters have their own way of attracting attention: They're home to the audio entertainment unit! Not all windows in Tuscany have outdoor window shutters. Those that don't sometimes have an outside curtain for sun protection. ... or it can be a regular curtain of outdoor fabric in front of a balcony door, suspended from a curtain rod on the outside wall. Modern awnings like the one to the right are relatively rare in old Tuscan villages and small towns; you'll see them mostly on new buildings. You can see that most of these windows have a counterwindow inside. The air trapped between the two serves as a very efficient heat barrier in the winter. The second window from the right combines the crisp look of the exterior window treatment with a useful function for the interior: Painting the recess white helps reflect sunlight into the room and, to some extent, makes up for the smallness of the window. These two pictures of window treatments from Northern Italy take the 'eyeliner' approach a bit further by adding some flourish and, if you look at the left photo, a stylized keystone ornament. It's an easy-to-copy look that can be very effective, even if you just add a skinny line around the window and a very small ornament (in a contrast color) above the center of the lintel. Many antique town centers in Northern Italy retain beautiful Baroque features in their architecture - but you don't need to live in a 17th-century home in Italy to be able to enjoy this style yourself. Last spring, I visited some towns in the foothills of the Italian Alps and took photos of exterior window treatments you could adopt for your own home, wherever you happen to live. So here are some pictures of window treatments that show both the original idea and their translation into a modern or simplified version. The photos above show a smart take on the ornament above the lintel. The ornament in the picture to the right was carved out of wet plaster at the time the house received its outer coat. The contrast between the white and light gray is minimal and, in combination with the 3D surface, gives this exterior window treatment a sophisticated look. Palladian grandeur rendered with a humble paintbrush! Next, a very pretty but labor-intensive version of the Baroque garland ornament (photo left). This type of corner design was used from the Renaissance onward (I found a sketch by Giovanni da Bologna in the Uffizi gallery in Florence). However, I have no idea what the design is called. So if you're an architecture history buff reading this, please contact me, because I'd really like to know! Of course it's nice to have a 3D version of this trim made by a plasterer, but it's also expensive. You could easily create the illusion of an exterior window trim by using masonry paint (there's another example of this in the next chapter, below). Having started out this page by praising the Italians' love of color, I feel I owe you at least some examples of how to use that color in your own exterior window treatments. Buff yellow and green, with some white thrown in, is a popular color combination on Italian houses. You'll find yellows with a lot of terracotta in them, as well as zingy, lime-infused tones, but the latter are quite rare in the north. If your house is painted white or gray (or any other non-yellow color), skip the yellow altogether and just use two tones of green for your exterior window trim. Here's one of the most-used exterior paint color combinations in home decorating (and in nature): red and green. Unlike candy colors, these pastel tints are grayed and mellow, as if bleached by decades of sunlight. 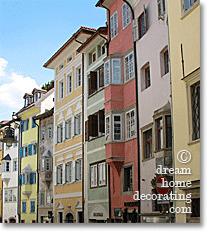 If you've been to Italy, or had a look at the page about Tuscan color schemes, you will recognize 'dusty' pink as one of the mainstays of Italian house color schemes - not just for exterior window treatments. These colors work well under a Mediterranean sun, but they tend to appear out of place in the cool Northern light. The next set of colors on this list is subtly elegant, with not a trace of warmth to it, except for the deep brown. You can use this palette successfully for exterior paint color combinations anywhere in the world, under any type of light. If you were to add flowers as exterior window treatments, reds and pinks look great here, with fresh (or dark) green foliage. The last sample in this collection (below) is taken from a Renaissance-style mural in Northern Italy - a colorful exterior window treatment that was extended to include the entire wall. I'm not suggesting that you paint your home in all these colors at once, but you could utilize the little swatches (or the whole mural) as a starting point for some house paint color ideas. I'd say you're safe to pick any two swatches and combine them with a creamy or chalky white. You could also dream up successful exterior paint color combinations from the top three, middle three, or lower three color swatches. Whatever you do, add white accents with a liberal hand! paint the walls a sage green, the window recess white, and add very pale, smoky blue 'eyeliner' and/or outdoor window shutters as exterior window treatments. Exterior window treatments in Tuscany are much more colorful than interior ones: Indoor Tuscan Window Treatments are strictly white cotton. However, to make up for the lack in color, they come in a lovely variety of styles, from farmhouse to palazzo living. Similarly, most (interior) Country Window Treatments in Europe are a white cotton affair - knitted, crocheted or woven. Pristine & pretty. Exterior window treatments in France usually consist of outdoor wood shutters, that's it. But French Country Curtains are pieces of fabric with, well, attitude. Have a look at window treatment photos from southern France! For more European country home inspiration, visit the Country Decorating Ideas section. Enjoy! Return from Exterior Window Treatments to Window Treatment Ideas. Return from Exterior Window Treatments to the Dream Home Decorating homepage.